Divers can enjoy various type of diving in Zamami village, such as diving at points with interesting geographical features and currents that are populated with many different types of creatures. There are around 40 diving services that you can join even without a diving license. For first-time divers everything can be rented at the diving service, including wetsuits and fins. 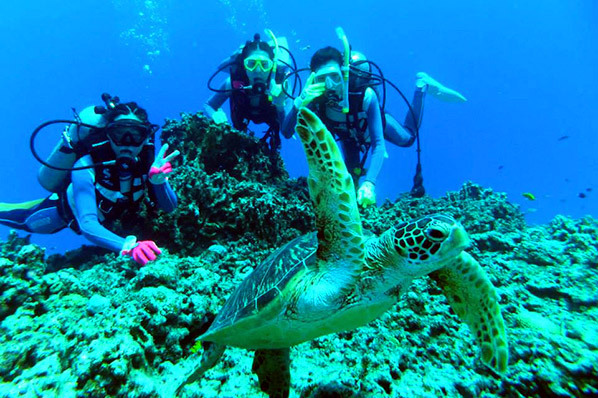 Instructors will dive along side you and show you beautiful spectacle in the sea. The 28 mile race starts from outside Ginowan marina and follows a course through the Kerama islands, finishing outside Zamami port. Even without diving materials, you can still enjoy watching the tropical fish that swim in the coral reef surrounding Zamami. The sea kayak is a one or two seat boat which, because it has no engine, has no negative influence on the environment.